Where about do your pictures start? In the beginning, there’s always a flask. I obviously have to drink it up first. But don’t you think I would paint every single bottle I’ve emptied. I put on my easel a small empty stretcher and rub a brush or palette knife against it, because flasks are made of scrapped off details of other paintings and of the pallet, as I work: made of pieces of rubbish. At that stage, I don’t as yet think of my stretcher in terms of a picture. Some completely casual motions start appearing (like e.g. as I start to apply those textures with the upper right-hand-side corner). The texture gets thickened, shapes start appearing, but still, this is all coincidental. Seated in my armchair, I’m watching what emerges out of the coincidence. And, pleasant memories start running through my head: some frenzy moments, a dance, a talk, some ideas, music, and, first of all, my ‘companion at flask’. And then, I paint the flask, mixed up with those moments. The picture emerges out of trash, gibberish. Always so with joy. And, always very fast. Then, there are some coincidental paintings, or, ‘trash paintings’? Is it that you don’t treat the works you make seriously enough? No, this is not really so. No such bottles get painted casually; true, they are painted on casually prepared supports, pieces of rubbish. Once all that hotchpotch has inspired me, I start my work, building a piece of painting. Any such picture is very important for me, both from a painter’s and a sentimental viewpoint. It’s like a notepad of a sort, a record taken of the while. And this is all reminiscences, all that? It happened just once to me that I drank my bottle up as I was painting it. This was Medoc, my birthday wine. A scent of moss and the delicate currant flavour which lasts long on your palate was getting mixed up with settling my accounts with the past, some recollections. All that taking place in a Warsaw tenement house, in Flory Street, on a grey December day … But I don’t associate those paintings with alcohol. 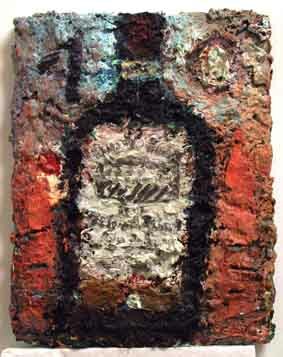 Usually, when I paint, an emptied bottle has already been removed far aside. Can you remember your first one? I sure do, it was painted in 2000, in Tamka St., Warsaw, after a series of nice meetings with Tadeusz Marx. The Two Pilzner beers hang now on his wall. A flask, a party, some people, the music … Does music turn you on? It does, in that it makes my consciousness step back as I paint: there’s the place for my emotion to make a picture. Moods do vary, as the music I listen while painting is diverse. If I go for classical, then there’s Mahler, Szymanowski, Lutosławski, Bartok. If for light (what a name, that! ), then I’d choose the NY Jazz Scene, the John Zorn circle: Riot, Medeski, Laswell, Baron, Patton, Frisell, Clucevsek. I sometimes like to listen to songsters, like Tom Waits or Wysocki. It so happens that Astor Piazzola puts me in a dancing mood. Sepultura can bawl and roar at me sometimes. How important is the way a bottle looks? Oh no you won’t. Some evening, a talk, laugh. And, the bottle... The one that needs being painted.